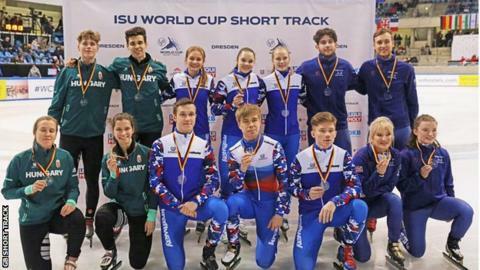 Great Britain won mixed relay bronze at the Short Track World Cup in Dresden, Germany. The British quartet of Elise Christie, Farrell Treacy, Jack Burrows and Kathryn Thomson finished in a time of 2:41.762, 1.235 seconds behind winners Russia, with Hungary winning silver. Korea won the race, but were disqualified after a penalty on the final corner. Thomson was delighted with the historic medal for Britain. She said: "With all the bad news we've had over the past year regarding losing funding and this being our last trip away as a full team, it means the world to me that we can stand on the podium as a team knowing that everyone has contributed to this success." Earlier, Christie, the 2017 triple world champion, had finished fifth in the women's 500m final in her first solo World Cup racing of the season. She said of the team medal: "I'm used to winning individual medals on the world stage but it's super cool to make history with the mixed relay team. I'm proud of all the team." The mixed relay event will make its Olympic debut at the Beijing 2022 Winter Games. The final World Cup of the season takes place in Torino, Italy from 8-10 February and will be followed by the ISU 2019 World Championships taking place from 8-10 March in Bulgaria.